"I just wanna do what I do"
In the past few months, Scott Weiland has said goodbye to Velvet Revolver and hello to the Stone Temple Pilots, and on November 25, he's hoping to reintroduce himself to the public as a solo artist with his album, Happy In Galoshes. The singer says he's, well, 'happy' with the record, claiming that it's the first time he hasn't felt beholden to anybody during the artistic process. "There's no rules, I don't have to worry about radio playing it," he says. "At my age, I just do what I wanna do. There's art and there's commerce, and I've already accomplished the commerce part of my career." Co-produced by Weiland and Doug Grean, with Steve Albini also engineering a handful of songs, Happy In Galoshes features guest appearances from three members of No Doubt: Tony Kanal, Tom Dumont and Adrian Young. Weiland states that the two-disc set is largely about his volatile relationship with his wife, Mary. (In 2001 he was arrested for domestic violence, and just last year his wife was arrested for setting fire to his clothing. Good times.) "I liken it to [Marvin Gaye's] I Met a Little Girl," Weiland says. "It chronicles our life." The singer is planning to tour in 2009 in support of Happy. Until then, he's on the road with the reunited Stone Temple Pilots through Oct. 31 in Pelham, Alabama. 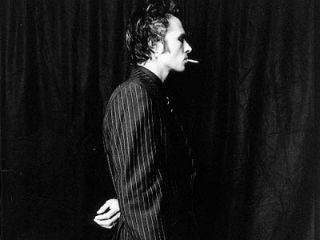 To hear what might possibly be the CD's first single, Paralysis, visit Scott Weiland's MySpace page.